SLUGGER® HIGH VELOCITY SLUGS. Remington® manufactures the only high-velocity 12- and 20-gauge Foster-style lead slug. This higher velocity slug exits the barrel at 1800 fps, 13% faster than standard 1 oz. slugs. The 7/8 oz. Slugger High Velocity delivers 200 ft-lbs more energy at 50 yards with flatter trajectory on deer than standard 1 oz. slugs. Produced in most popular slug loadings - 2 W and 3" 12-gauge and 2 W 20-gauge with a 'A oz. lead slug. Designed for the avid deer hunter using smooth bore guns. 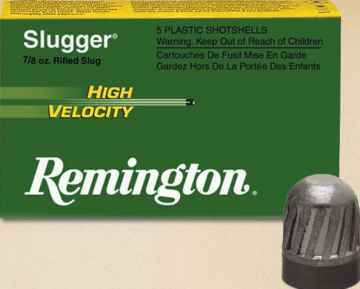 Remington's most popular, accurate, hard-hitting slug. Slightly oversized for great smooth-bore shotgun performance, resulting in better sealing against the barrel wall for greater accuracy. Index/EDI No. Gauge Length (oz.) Muz. 50 yds. 100 yds. Muz. 50 yds. 100 yds. 50 yds. 100 yds.